Meat lovers have been raving about Pitt Cue, formerly trading from a van under Hungerford Bridge and now in its new Soho home on the corner of Newburgh Street. Just off Carnaby Street, its location could hardly be more central. Set up by Tom Adams, ex-Blueprint Cafe and the Ledbury and friend Jamie Berger, a line snaked out the door at this American style smokehouse as soon as the news went round that they'd found a permanent home. On a Tuesday lunchtime before 1pm the queue was already formed. “Today’s Beasts” were Gloucester Old Spot and North Devon beef and the charcoal grill delivers tender, flavoursome American barbecue style favourites like Pulled Pork, Ribs and Brisket. Portions are large and meats come with house pickles. The queuing system has the novelty of your own numbered “cow” tab for drinks whilst you wait for one of the tables in the tiny downstairs to come available. 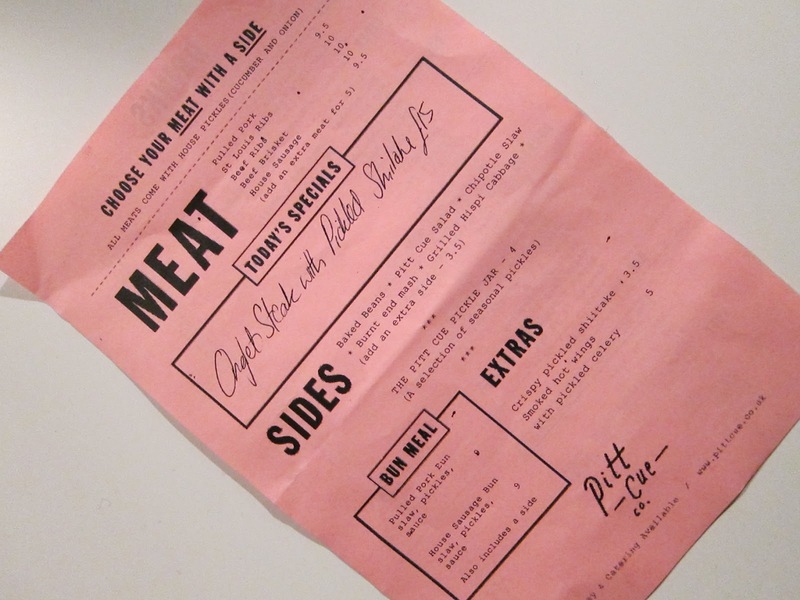 The drinks menu is heavily American inspired with beers, cocktails, Bourbons and Ryes, and soft drinks. Their Picklebacks - a bourbon shot with a house pickle brine chaser and pork scratchings - has attracted a lot of positive attention. Not my thing I'm afraid. Thankfully for me, closer inspection turned up local gems like the Kernel Brewery pale ale. Tables turn fairly quickly even though service is a little slow with the tiny kitchen delivering take away as well as eat-in. Main dishes are generous and simply presented street-food style, but here in enamel dishes. Desserts seem a little incongruous but do continue the American theme by serving up ice cream with both a chocolate brownie and a lemon tart with rhubarb and ginger. It’s a friendly place. The bill came to £60 for 3 people. Would I go back? Yes, if I was with friends of a strong carnivorous bent.